Another central agency change here as Tomaso Polli at Edmiston sends news that he's been appointed joint central agent with Flagship Yachts for the sale of the 122m motor yacht Alexander. 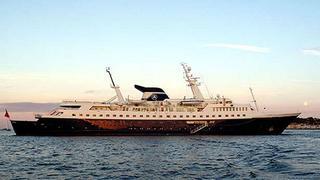 Alexander started life in 1965 as a passenger vessel built by Lubecker Flender Werke in Lubeck, Germany. After several changes of ownership she was converted into a superyacht by the late John Latsis, a Greek shipping tycoon. Extensively refitted in 1985 and again in 1998, she offers well-appointed accommodation for up to 80 guests in 40 staterooms. This superyacht’s facilities include a swimming pool, hospital, gymnasium, a 27-seat cinema and a beauty salon plus a permanent helicopter landing pad. Lying in Athens, Alexander is asking €35 million.